Th Super Eagles played out a 1-1 draw against Algeria in Friday's World Cup qualifier at Stade Mohamed-Hamlaoui in Constantine. 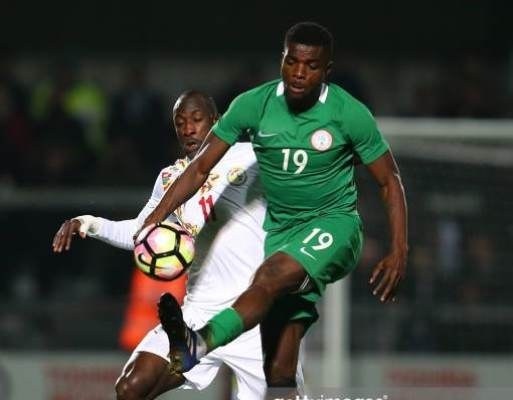 It was John Ogu that gave Nigeria the lead in the 62nd minute before Algeria pulled level late from the penalty spot through their captain, Yacine Brahimi. The Eagles in all were unbeaten as they had 14 points from six games during the qualifiers; winning four and drawing two. It was Ikechukwu Ezenwa that was chosen ahead of Daniel Akpeyi and Francis Uzoho in goal. In the defence, the quartet of Abdullahi Shehu, William Troost-Ekong, Leon Balogun and Ola Aina got the nod of the Franco-German tactician. Oghenekaro Etebo has gotten the nod over Uche Agbo in midfield, while John Ogu and Wilfred Ndidi also started. Upfront, the trio of Alex Iwobi, Anthony Nwakaeme and Kelechi Iheaancho led the chase for goals against the North Africans.